Common mullein stand. Gary Stone Photo. Common mullein is a biennial forb found throughout the Great Plains. It is a state or local county noxious weed in Nebraska, Colorado, and Wyoming. Common mullein is also known as Jacob’s staff, flannel leaf, velvet plant, velvet dock, or flannel plant. Figure 1. Common mullein mature seed head. Gary Stone photo. Figure 2. Common mullein rosette. Gary Stone photo. Figure 3. Common mullein flower stalk. Gary Stone photo. Originally from Europe, Common mullein was first reported in North America in the mid-1700s as an ornamental, a medicinal herb, and used as a piscicide, a chemical substance poisonous to fish. Common mullein is distributed across most of North America. Common mullein is an herbaceous biennial forb. It reproduces / spreads by seeds. Common mullein is a prolific seed producer. Large mature plants can produce up to 240,000 seeds per year (Figure 1). Seeds can remain viable in the soil for over 100 years. Seeds germinate in the fall of the year and form a basal rosette. During the second year of growth, the plants “bolt” and produce a flower stalk. Wildlife, vehicles, construction equipment, livestock, forages, feed grains, soil, and gravel spread seed. Common mullein has an extensive fibrous and tap root system. The root system allows the plant to access soil moisture better than native plants. This gives the common mullein a competitive advantage, especially during dry years. Rosettes can be over 2 feet across (Figure 2). Rosette leaves can be over a foot long and are covered with dense hairs, giving it the feel of velvet. The flower stalk can be 2 to 8 feet tall. Leaves are alternate and progressively smaller to the base of the seed head. There is usually a single flower stalk packed with sulfur-yellow colored flowers. Flowering occurs in June and July (Figure 3). The flowers are five-lobed and united at the base. The seed capsules are woolly and contain numerous small seeds. Prevention is the best and cheapest management option. Detect infestations early and keep from spreading. Having well-established grasses and forbs on a maintained pasture or rangeland with proper grazing and rotational grazing techniques can go a long way to prevent its establishment. Scouting, monitoring, and proper identification are key factors for management. Infestations and spread of this weed can occur very rapidly. Pulling or cultivating small Common mullein plants can be an effective control method, as long as the plants are young - before they go to seed. Mowing can be effective to reduce seed production but must be repeated throughout the season. There are two potential biological control insects for Common mullein. The curculionid weevil (Gymnetron tetrum) and the mullein moth (Cucullia verbasci). The weevil larvae feed on the seed in the seed capsule and can destroy up to 50% of the seed. The moth larvae feed on the foliage of the plant. The release of biological control methods should be entered into only after full consideration of potential non-target species impacts. Other methods must be utilized in combination to reduce and control the infestation. 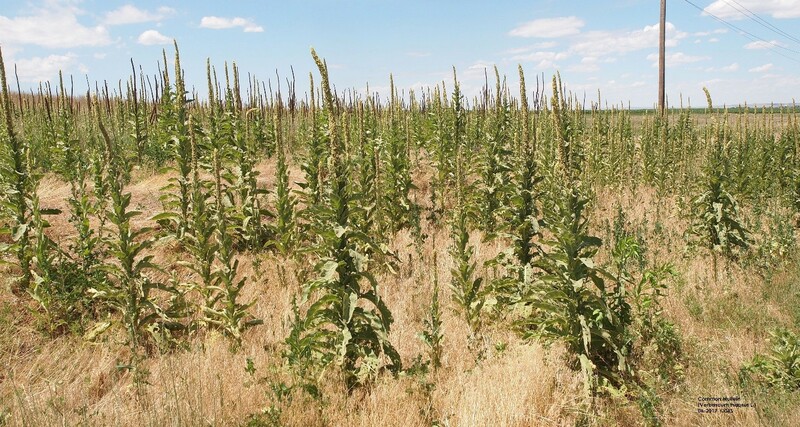 There are a number of chemical treatment options available to manage Common mullein. Consult the specific herbicide label for instructions on how to treat Common mullein for the timing of application, amount of water carrier and herbicide rates. The dense hairy leaves affect the coverage and uptake of the herbicides and cause erratic control. It is important to follow the product label unique to each individual herbicide. Be sure to consider the site, overall weed complex, forbs, shrubs and trees when selecting an herbicide. When the herbicide label allows, the use of a crop oil concentrate (COC), methylated seed oil (MSO), or other oil-based adjuvants may improve herbicide penetration through the hairy leaf surface, although grass injury may occur. Spring rosette to early bud/bolt stage is generally the recommended time to apply herbicides. Retreatment of infested areas with Common mullein may be needed due to the long life of the seeds. Some herbicides labeled for Common mullein can be found in Table 1. Herbicide group numbers refer to the mode of action the product has in the plant. Utilizing different modes of action can help reduce the chance of herbicide resistance in the target weed species. Be sure to select a product labeled for the site. Read, understand and follow all label instructions when using any pesticide. Pesticide labels and safety data sheets (SDS) can be found at https://www.cdms.net/. Create an Integrated Pest Management plan (IPM) combining different control strategies to manage Common mullein and promote the desired plant community you want.